A few decades ago, even a short, amateur film cost hundreds--or thousands--of dollars to make. And your friends couldn't see it unless you invited them over and set up the 16mm projector. Today, the phone in your pocket, the PC on your desk, and the Internet offer the opportunity to prove yourself as the next Tim Burton...or the next Ed Wood. Whether you're shooting an updated version of Oedipus Rex or merely polishing up your home movies, learning a few moderate skills can help you keep your work out of the Plan 9 From Outer Space category. First I'll show you how to get rid of the "shaky-cam" effect that makes so much phone-shot video unwatchable. Then I'll recommend a couple of programs for editing your masterpiece. And finally, I'll walk you through posting your work on YouTube. Paul Greengrass used a shaky camera for dramatic effect in his Bourne movies, but the technique also nauseated some audience members. And you really don't want to make your family and friends ill. Unfortunately, phones aren't designed for smooth camerawork. They don't come with grips that help you hold them steady, or with the sockets necessary to attach them to tripods or to any of the small, portable steadying devices that use the tripod socket. For a truly steady shot, however, you'll want to attach your phone to a tripod. Since your phone lacks a tripod socket, you'll need an adapter. You can make one with a case for your phone, a few inexpensive gadgets that you can buy at any hardware store (any socket that can accommodate a quarter-inch screw can attach to a standard tripod), and a little ingenuity. If you're lacking in ingenuity, check out how-to videos; "DIY iPhone Adapter for a Tripod" on Vimeo and "DIY Any iPhone Tripod Adapter" on YouTube are good choices. Although both of those instruction videos are iPhone-specific, the steps will work with any smartphone for which a case is available. If you're not the do-it-yourself type, you can purchase a ready-made adapter--but look carefully before you buy. Two of the three adapters I tried for this article made different variations of the same idiotic mistake: They put the socket in the wrong place. That shouldn't be so difficult to figure out; the socket belongs on the side of the phone facing down when you use it as a video camera. On most smartphones, that's the long edge. One mini-tripod with adapter that I looked at, Quantaray by Sunpak's QSX-VersiPod, put the socket on the short end, making it great for portrait work but not video. Pedco's Cellpod and Cellpod Adapter placed the socket on the phone's face or back, depending on how you inserted the phone--perfect for photographing the sky or the tripod. Any decent tripod allows you to adjust the angle to take care of such shortcomings. But for a straightforward shot, you shouldn't have to make any tweaks. Steven Spielberg expected the giant-shark movie to destroy his still-young career. The picture was over budget and didn't look like much. But his more experienced editor, Verna Fields, knew how to turn the biggest problem with Jaws--very little usable footage containing a shark--into its biggest asset: What you can't see can scare you. You don't need Fields's talent and experience to improve your work in the editing room. But you do need the right software--and the right hardware. A smartphone doesn't qualify. Sure, you can download a video-editing app for your Android handset or iPhone, but the phone itself is not the right tool for the job. You want a fast processor, a large hard drive, and, especially, a full-size monitor--the more monitor space you have, the easier editing will be. I recommend that you move the videos from your phone to your PC so that you can properly edit the movie. All decent video editors work in the same general way: First, you import the videos, photos, and music you might want to use into the program's library. You then drag and drop those items into the desired order, trimming them as you see fit. You insert fancy transitions such as fades and wipes (sparingly, if you're smart), and maybe add music. You save your work as a project file, which doesn't actually contain audio or video, but simply directions that allow the program to play the video back. When you're satisfied, you export the complete work in another form, such as a DVD or an .avi file. I'll start by discussing a free video-editing program. Windows XP and Vista came with an elementary video editor, straightforwardly called Windows Movie Maker. 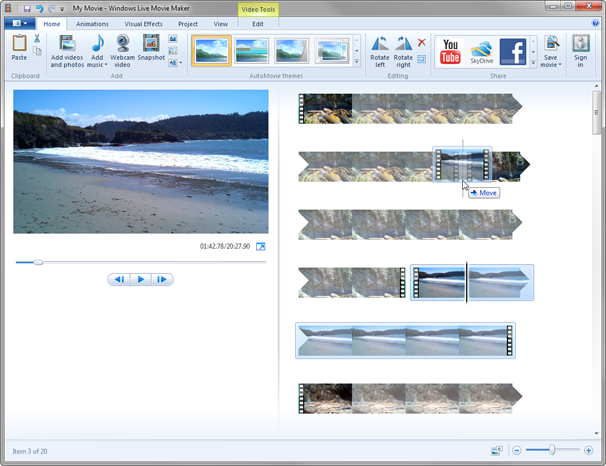 Windows 7 carries no such extra, so Microsoft offers the new version, Windows Live Movie Maker, as a free download. This program also works in Vista, but not in XP. You could use Windows Movie Maker, but that would involve an additional hassle, since WMM doesn't support common phone formats such as .mov and .3gp. You could use a program like Android Video Converter to switch them, but not without loss of quality. 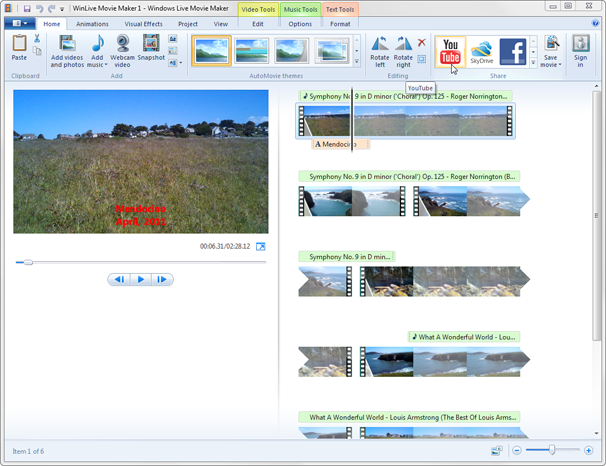 Windows Live Movie Maker is a free basic video-editing application for Windows 7 and Vista. So I'll stick to Windows Live Movie Maker here. This is an exceptionally simple and intuitive program; if you've never edited video before, you'll find yourself up and ready in this editor right away. The library into which you import videos is also the storyboard on which you arrange them through dragging and dropping. An Office-like series of ribbons lets you easily import files, sync video with music, add transitions and credits, and export your masterpiece. Experienced editors, however, may find working with it difficult and frustrating. For instance, it lacks a timeline--a graphical tool that lets you view the shots in a movie along a ruler laid out in minutes. It also doesn't allow you to edit picture and sound separately; that means you can't cut away from your daughter talking about ice skating to her performance and have the talking continue as a voice-over. Novices won't know that such features are missing; experienced editors will want them back. 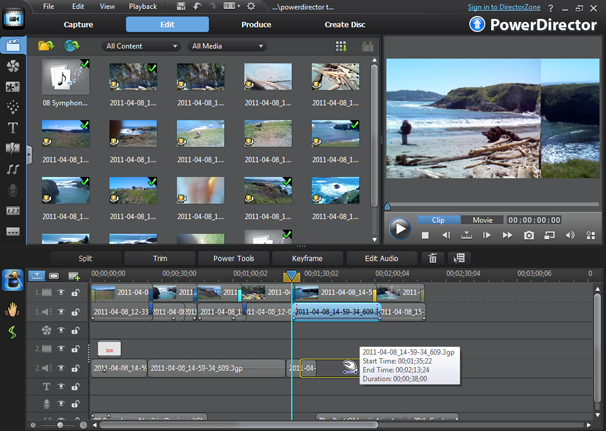 CyberLink PowerDirector is a relatively low-cost video editor. 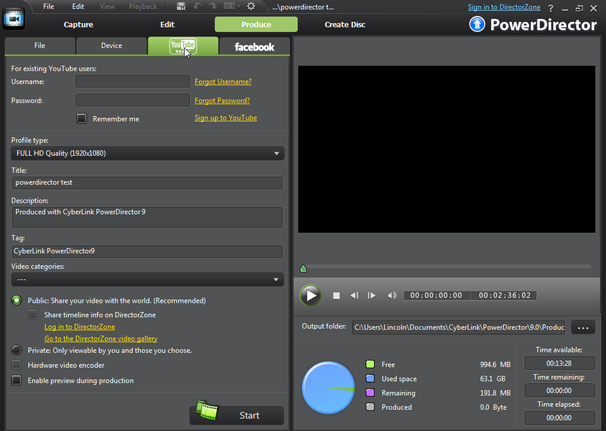 If you want to get serious about editing, look at CyberLink's PowerDirector. You create a movie by dragging clips from the library to the timeline, which has two video tracks, three audio tracks, and additional tracks for narration, titles, and effects. You can add more video and audio tracks, too--and yes, you can edit video and audio separately. PowerDirector lists for $70, but I've seen it for as little as $50. PowerDirector's Trim tool in action. Once you learn the program, though, it makes the editing process much easier. Assume, for instance, that you want to trim a shot. You select the shot on the timeline and click the Trim button. The resulting dialog box helps you zero in on the exact frame to cut on. Charles Burnett completed Killer of Sheep in 1977. Despite winning a prize at the 1981 Berlin International Film Festival, the independent drama didn't become widely available until 2007. That doesn't have to happen to your movie. You can burn it to DVD, convert it to any number of video formats, or copy it back to your phone in its newly polished form. You can also upload it to a video site so that anybody with an Internet connection can watch it. Here's how to upload your video to YouTube in the two editing programs I just recommended. 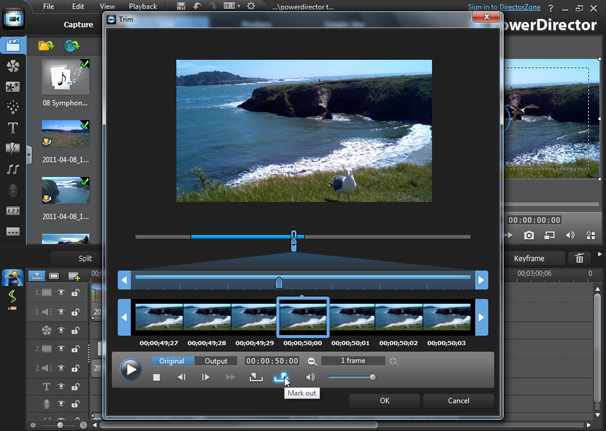 Export directly to YouTube from Windows Live Movie Maker. In Windows Live Movie Maker, start by clicking the YouTube icon on the Home ribbon. I'm tempted to tell you to just follow the prompts, but there's one particularly annoying prompt I should warn you about. If you're using PowerDirector, you can export directly to YouTube from this tab. PowerDirector doesn't require you to belong to anything other than YouTube (or Gmail). But it doesn't offer anything as obvious as a YouTube icon on the Home ribbon, either--it doesn't even have ribbons. Instead, click the Produce button on the top of the window, and then select the YouTube Ready tab. Fill in the resulting form, including your YouTube username and password. Click Start. Okay, probably not. But the relatives and friends who do watch it--as well as a few strangers, perhaps--will enjoy a smoothly shot, well-edited video. See, uploading your video to YouTube won't get people to watch it. For that, you need people to find it and view it. Telling relatives and friends is easy: You just e-mail them the URL. You can attract a wider circle by announcing the video's release on Facebook, Twitter, and other social networking sites. To do so, click the Share button on your video's YouTube page and go from there. To attract strangers, improve the likelihood that it will turn up on searches. Put potentially popular words in the title, description, and tags fields. To do this once the video is up, click the Edit Video Detail button in upper-left corner. How do you identify popular keywords? Search for videos on similar subjects, and note what words they use. Also, you can use YouTube's Annotations feature to add links from one video to another, or the Video Response feature to engage other YouTube channel operators in a video-response conversation that might draw their viewers into your channel. Learn to use YouTube's built-in social features, and you'll see a nice boost to your video views.